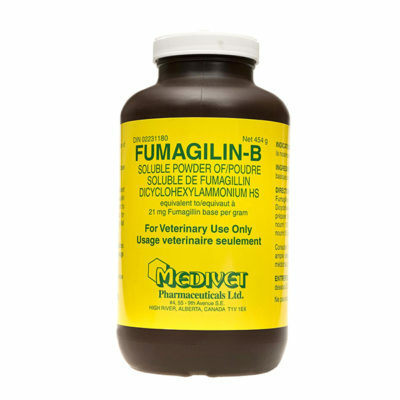 Fumagilin-B aids in the prevention of as well as the only known antibiotic treatment for the Nosema Spores which is especially prevalent in spring packages and NUCs as well as over wintered colonies. It left untreated Nosema robs the bees of their strength and vitality which can lead to the death of the colony. There is enough Fumagilin-B in this container to mixed with 90 gallons of syrup and can be treated by drenching or direct feeding. 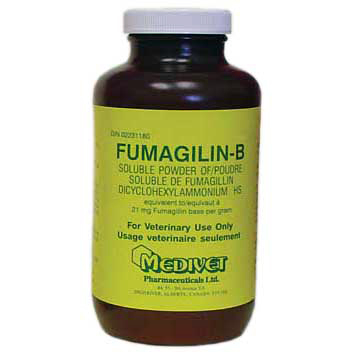 Fumagilin-B aids in the prevention of as well as the only known antibiotic treatment for the Nosema Spores which is especially prevalent in spring packages and NUC's as well as over wintered colonies. It left untreated Nosema robs the bees of their strength and vitality which can lead to the death of the colony. There is enough Fumagilin-B in this container to mixed with 20 gallons of syrup and can be treated by drenching or direct feeding.